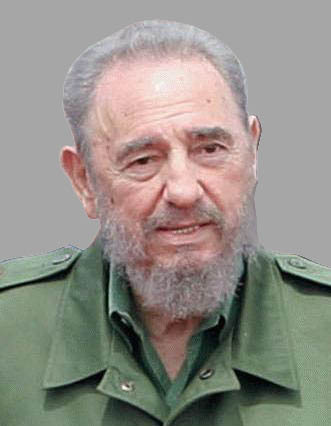 When these lines are published in the Granma newspaper tomorrow, Friday, the date of July 26, when we proudly remember the honor of having resisted the imperialists’ attacks, will be felt distant, despite the fact that it is only 32 days away. Those who determine every step of humanity’s worst enemy –the US imperialism, a combination of miserable material interests, contempt and underestimation of the other peoples who inhabit this planet—have calculated everything with mathematical precision. In the Reflection of June 16, I wrote: “The diabolic reports slide down little by little in between matches of the Football World Cup, so that nobody takes notice.” The famous sports contest is now in its most exciting moment. For 14 days, the teams with the best players from 32 nations have been competing to advance to the stage of quarter-finals, semi-finals and then the final competition. The sports enthusiasm grows constantly attracting hundreds of millions or perhaps even billions of people worldwide. But, we should be wondering how many are aware that from June 20 US warships, including the aircraft carrier Harry S. Truman, escorted by one or more nuclear submarines and other warships carrying missiles and cannons more powerful than the old battleships used during the last World War between 1939 and 1945, have been moving towards the Iranian coasts via the Suez Canal. This movement of the Yankee naval forces is accompanied by Israeli military ships, carrying equally sophisticated weaponry, intended to supervise any vessel involved in the import or export of commercial products required by the Iranian economy for its operations. Following a US proposal supported by the United Kingdom, France and Germany, the UN Security Council passed a tough resolution which was not vetoed by any of the five countries with the right to do it. Another tougher resolution was adopted by the US Senate. Later, a third and even tougher resolution was approved by the member countries of the European Community. All of this happened before June 20, which motivated French President Nicolas Sarkozy to make an urgent trip to Russia –according to press reports– to meet with the head of Sate of that powerful country, Dmitri Medvedev, in hope of negotiating with Iran and preventing the worst from happening. Now, it’s a matter of calculating when the American and Israeli naval forces will be deployed off the coasts of Iran joining there the aircraft carriers and other US military ships already on watch in the region. It is still worse that, the same as the United States, Israel –its gendarme in the Middle East—has state-of-the-art fighter planes and sophisticated nuclear weapons supplied by the United States, which have turned it into the sixth nuclear power on Earth, in terms of its fire power, and one of eight such powers that include India and Pakistan. The Shah of Iran was overthrown by the Ayatollah Ruhollah Khomeini in 1979 without firing one shot. But then the United States imposed on that nation a war with chemical weapons whose components it supplied to Iraq along with the information required by this country’s combat units; such weapons were used against the Guardians of the Revolution. Cuba knows this because, as we have said before, our country chaired the Non- Aligned Movement at the time. We know very well the damage done to the populations. Mahmoud Ahmadinejad, currently the head of State of Iran, was chief of the sixth army of the Guardians of the Revolution and chief of the Guardians Corps in the western provinces, which carried the bulk of that war. Today, in 2010, thirty-one years later, both the United States and Israel underestimate the one-million men that make up Iran’s Armed Forces and their fighting capacity on the ground as well as the air, sea and ground forces of the Guardians of the Revolution. These forces are compounded by 20 million men and women, ages 12 through 60, selected and systematically trained by their various armed institutions, from the 70 million people who live in that country. The US administration worked out a plan to promote a political movement that based on capitalist consumerism would divide the Iranians and overthrow the government. Such hope is now harmless. It’s simply ridiculous to think that the US warships and Israeli forces combined could win the sympathies of even one Iranian citizen. I initially thought, as I analyzed the current situation, that the conflict would start at the Korean peninsula, where the second Korean War would break out, and that another war would immediately follow; the one that the United States would impose on Iran. Now, we are witnessing a different turn of events: the war in Iran will immediately spark off that of Korea. The leadership of North Korea, which was accused of sinking the ‘Cheonan’ and which knows only too well that said ship was sunk by a mine attached to its hull by the Yankee intelligence services, will not miss a second to act as soon as Iran is attacked. It is only fair that football fans freely enjoy the competitions of this World Cup. I simply fulfill my duty of informing our people, as I think mostly of our youths, full of life and hopes, especially our wonderful children, so that the developments do not catch them by surprise. It hurts to think of the dreams conceived by human beings and the amazing things they have created in barely a few thousand years. At a time when the most revolutionary dreams are coming true and our homeland is firmly on the path to recovery, I would so much like to be wrong! Wednesday 16 June was celebrated at EXOTIQUE art gallery the Grand Opening of Art Exhibition: ORIENT COMES TO ROMANIA and as we can without a doubt say: Romania was falling in love with the Orient. The proofs are countless : over 250 participant at the Grand Gala , over 22 diplomatic mission`s participating and at the place of honor the ambassadors of Qatar, Japan, Palestine , Tunisia, Macedonia, Algeria etc. and the special appearance of His Royal Highness Quinn Anne of Romania. 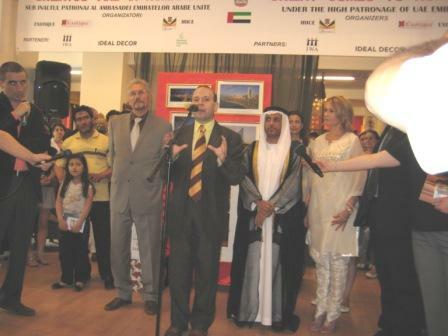 The opening speech of the art exhibition was that of President Emil Constantinescu who appreciated the efforts of Mrs. Pusa Hack the owner of Exotique brand to bring this art show in Romania and to offer to the event an original oriental flavor. I was traveling the Orient as President and in this exhibition I can guarantee you that I can find all the charm, the wealth and the glamour of the Orient said the former President. Mrs. Pusa Hack, the owner of Exotique brand has emphasized the fact that for here the Orient is not a recent discovery but a life time experience and passion and a continuous pleasure. Everything that is in this art gallery and in my Exotique stores and implicit this exhibition is the result of long searches in the most hidden places, in the forgotten towns and art craft centers in a continuous search for beauty. I want Romania to love Orient as I love him and to look them from my point of view, concluded Mrs. Pusa Hack. 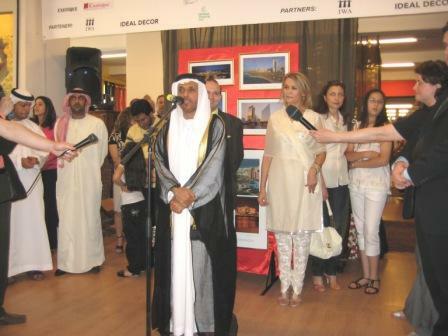 His Excellency Ambassador Yacoub Yousef al Hosani from United Arab Emirates, country that generously offered his high patronage to the Oriental Art Exhibition stated that: I wish that United Arab Emirates will be better known and understood in Romania with their tradition, with the feeling of openness and generosity and the joy of sharing everything with friends feeling that is part of the United Arab Emirates way of life. 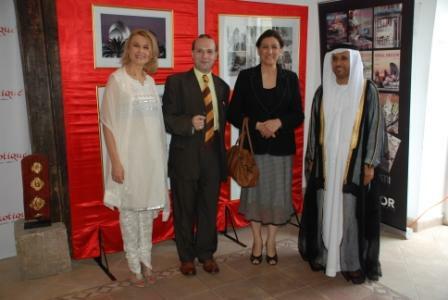 For this we share everything today: knowledge, art, beauty with our Romanian friends today, we want to be known better and this exhibition is realizing exact that: Is building bridges of friendship between United Arab Emirates and Romania. The Romanian Member of Parliament Catalin Nechifor has addressed the Parliament congratulatory message for this: exceptional cultural activities that are making our country a center of culture and originality. Catalin Nechifor , Member of Romanian Parliament adressing the congratulation message of the Parliament. 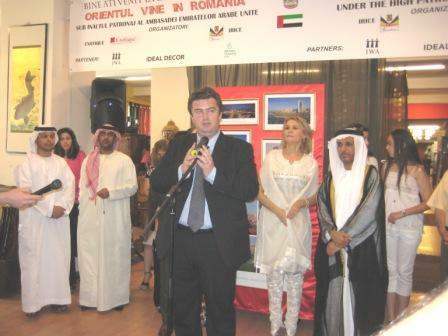 Professor Anton Caragea, director of Institute of International Relations and Economic Cooperation, co-organizer of the exhibition declared that is a moment of national pride for Romania to be able to host and organize an event of such magnitude and glamour that underlines the importance of Romania in the world. Professor Anton Caragea , director of IRICE adressing the opening speech. 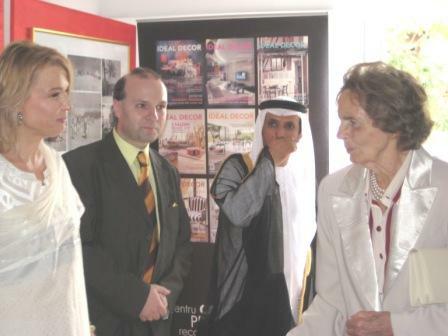 The exhibition tour had lasted two hours, time for visitors to receive the story and the information’s regarding the treasures of the art exhibition from the two of most qualified guide’s: His Excellency Ambassador Yacoub Yousif Al Hosani and Mrs. Pusa Hack. The two encouraged the visitors to travel from United Arab Emirates to India and Indonesia, a world of mystery and charm. Finally the visitors could also taste the magic of the Oriental cuisine in an exquisite food show offered by the Embassy of United Arab Emirates. 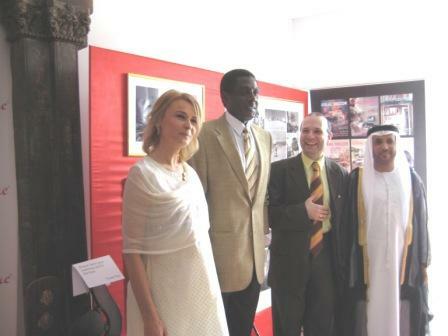 The exhibition has ended in a festive atmosphere when EXOTIQUE brand has received a new recognition of his cultural efforts being selected for the high honor of being the official partner for diplomatic activity organized by Institute of International Relations and Economic Cooperation and His Excellency Ambassador of United Arab Emirates, Yacoub Yousif Al Hosani was publicly awarded for his sustained efforts in developing cultural, economic and political ties between Romania and United Arab Emirates with the ROMANIA MEDAL OF HONOR as a public demonstration of the importance that United Arab Emirates is holding in Romanian public life. 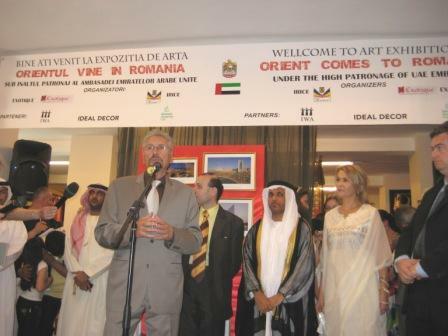 The Art Exhibition ORIENT COMES TO ROMANIA will remain open to the public interested in the values and culture of the Orient until 21 of June being considered in unanimity as the most important cultural and diplomatic event in 2010 so far. 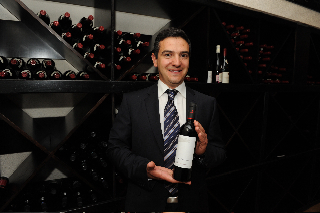 CORCOVA WINE WAS SELECTED AS THE EUROPEAN DIPLOMATIC REPRESENTATION WINE FOR 2010. On 3 June 2010 was the moment when European international activity enrolled another representative of European Union values: Corcova wines. 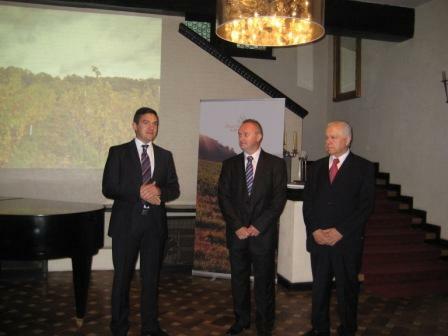 On 3 June was held the official presentation of Corcova wines for Romanian and European market .From the beginning the author of this renaissance, Mr. Serban Damboviceanu has stated that: I was convinced of the wine potential of Romania and I often regretted that the Romanian wines are not well known abroad. For this reason I have proposed myself to make an excellent Romanian wine and to restore to Corcova the former glory and also to European wine, we might add. Corcova Roy&Damboviceanu, the new brand that leads the offensive for re-conquering the world market for Europeans wine appears on the market with high quality and world renowned wine category as: Cabernet Sauvignon, Merlot, Chardonnay, Merlot Rose, Pinot Noir, Syrah, Muscat Ottonel, Sauvignon Blanc and Black Feteasca. In this offensive of re-establishing the values of Romanian and European wine on international markets based on quality the Roy & Damboviceanu Winery comes with strong argument`s : 55 hectares of ecological and traditional manner cultivated grapes , an experience of over 300 years , an exploitation dating back to Roman Empire time and a modern investment in technology of over 3 million euro. As a supplementary plus all this investment is under the supervision of a strong, dynamic and young team composed of Michel Roy and Serban Damboviceanu that also gives the name of the high quality brand of Roy and Damboviceanu. Finally this experience already succeeded in achieving the title of the official partner of European international diplomacy and representation activities from European Council on International Relations . This prestigious title awarded to Roy & Damboviceanu Winery already nominates Roy & Damboviceanu as a renowned ambassador of European Council on International Relations used in all protocol and international activity to represent Europe. 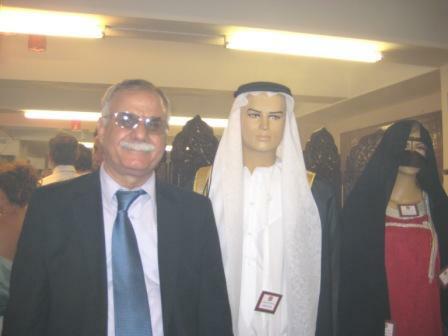 legitimate and unique representative of Syrian people.